Elphaba: And it's all green! — Wicked, "One Short Day"
Green is one of the most soothing colors in existence, occurring squarely in the middle of the visible light spectrum. 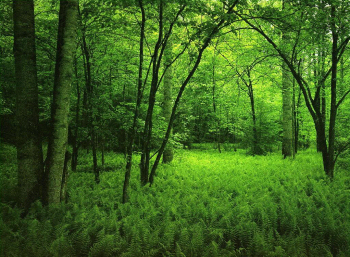 It is the color of most plants (and the color of chlorophyll), and it often symbolizes a strong healthy environment. By the same token, green has come to symbolize envy, poor health in people, and strange and unusual powers in anything not considered part of nature. Ghosts, digital technology and radiation are all associated with green. Occasionally it can also symbolize greed, incidentally also being the famous primary color of United States bank notes. Culturally, it is well-known as the symbolic color of Ireland, of the environmental movement, and of Islam.